A Kindle is Amazon’s proprietary e-reader, which displays e-books saved in Kindle format. To sell e-books on Amazon or read non-Amazon documents on a Kindle, you need to save them as Kindle format .mobi files. We’ll show you how to create, save, and convert e-books and documents as .mobi files using free online tools. There are several ways to save and convert e-books and other documents into Kindle format as you’ll see below, but the easiest option is to tap the pros at Fiverr. 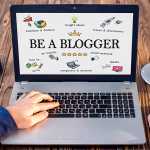 From quick Kindle file conversions to complete e-book editing and Kindle formatting services, Fiverr’s budget-friendly freelancers have the tools and know-how to get your job done fast. There are three primary ways to create or save e-books in Kindle book format, and the best method for you depends on your intended use. Authors writing e-books generally have different Kindle formatting needs than readers who want to read e-books that didn’t come from Amazon on their Kindle device. Here’s a closer look at each of these options, along with some different tools that you can use to create, save or convert your documents or e-books into Kindle format. e-Book creation software are word processing programs specifically designed to help writers write. You can organize, write and save manuscripts quickly in Kindle book format as well as in other e-book and print-ready files using them. e-Book creation tools are end-to-end systems that streamline the entire process, plus make handling challenging tasks like inserting images or tracking changes and revisions quick and easy. Reedsy’s simple interface lets you type and format your manuscript on screen or copy and paste it quickly from whatever word processing program you use. Reedsy is a free e-book creation tool that combines word processing, book design and e-book file export within a seamless cloud-based, mobile-friendly system. 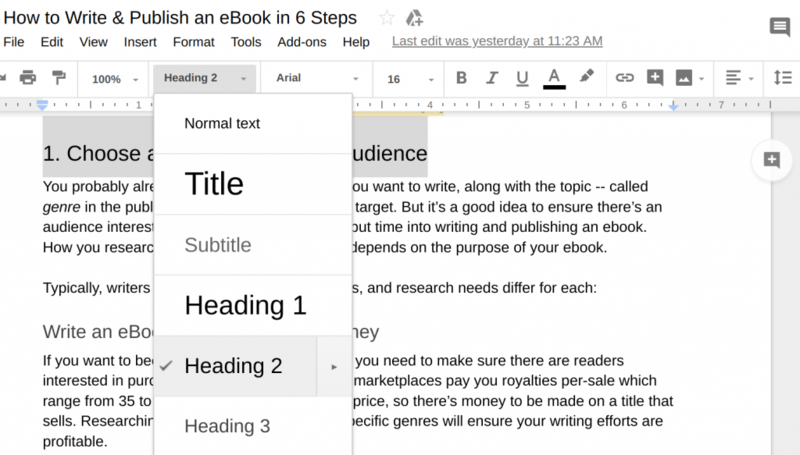 Using Reedsy, you can type your book content directly into its easy-to-use interface or copy and paste book content from Google Docs or other word processing programs. You can also organize your manuscript into parts and chapters and add images and a cover. When ready to publish, Reedsy exports an .ePub file, which Amazon automatically converts to Kindle format for you when you upload your e-book to KDP. We used Reedsy to turn our content into an e-book to list on Amazon and on other book distribution websites. It was simple, fast and best of all — free. Scrivener is loaded with tools that help serious writers create all types of works from business marketing e-books to novels and textbooks. Scrivener provides a ton of writing and manuscript development features for a relatively low price. It’s not free, but it’s full of organizational tools including chapters and parts, image management, story outlines, storyboarding, research section and built-in e-book formatting tools. Like Reedsy, Scrivener exports documents in .ePub files that Amazon converts to Kindle format for you automatically when you upload your book to sell on Amazon KDP. 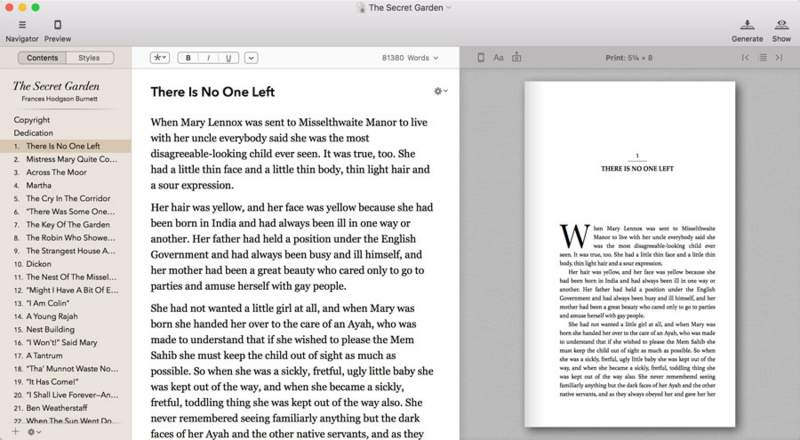 Like everything Mac-based, Vellum gives authors a top-notch user interface and plenty of design, page formatting and file export tools to create Kindle format e-books. 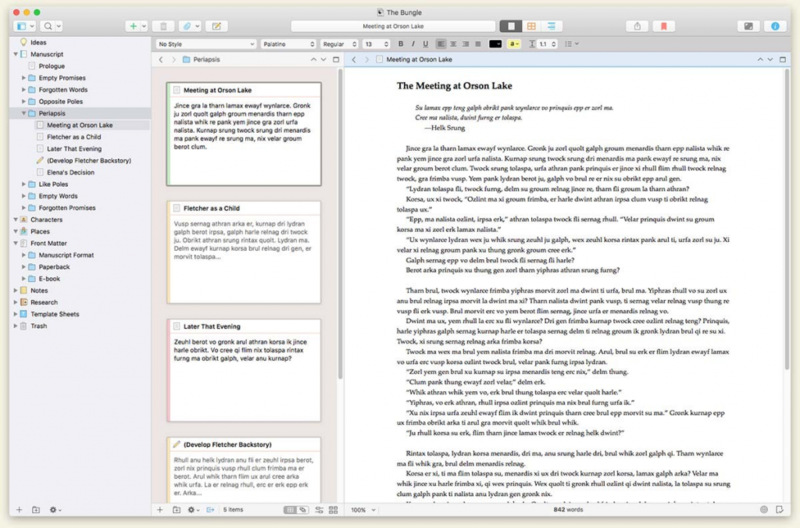 Writers who use Macs can use the popular Vellum book creation software, which has a lot of fans because of its formatting and export options. Like Scrivener, Vellum combines word processing, book layout, chapter and part organization, research documentation and export features in one complete package. At $199, it’s rather pricey but delivers serious e-book creation tools for authors using Macs. Unlike Reedsy and Scrivener, Vellum exports files in .mobi Kindle book format, which upload to Amazon KDP without any conversion. Your Amazon KDP author dashboard has several tools that convert files and documents to Kindle book format. The most widely used is Kindle Create, which is Amazon’s own e-book formatting and conversion tool. 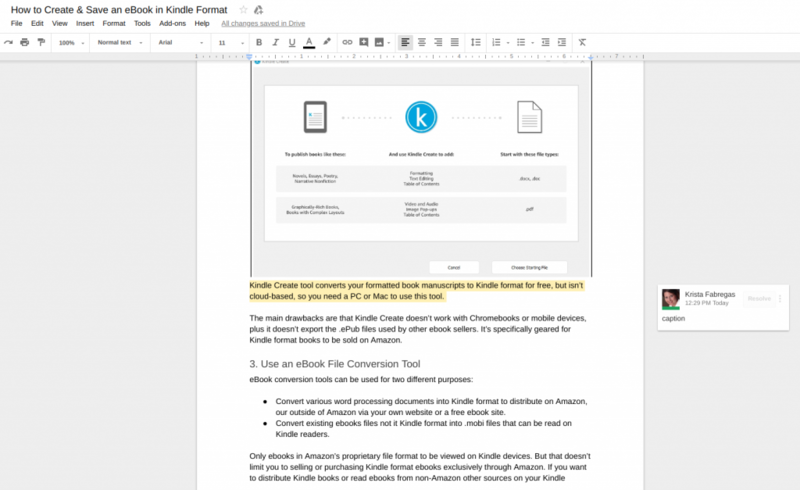 Kindle Create is free downloadable software for PC or Mac — it’s not a cloud-based tool like Reedsy. Kindle Create lets you import your manuscript’s word processing file and convert it to Kindle format. Unlike the e-book creation tools listed above, Kindle Create isn’t a from-scratch writing tool. You start with your e-book already formatted in a word processing file, like a .doc, .docx or .pdf for image-heavy works. 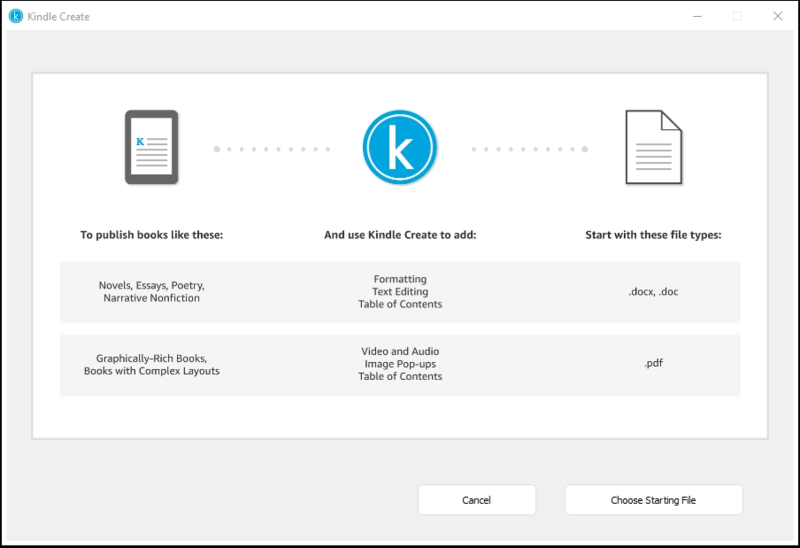 KDP Kindle Create converts your formatted book manuscripts to Kindle format for free, but it isn’t cloud-based, so you need a PC or Mac to use this tool. Its two main drawbacks are that Kindle Create is downloadable software that doesn’t work with Chromebooks or mobile devices. Plus, it doesn’t export .ePub format files that you need to sell books on other marketplaces like Smashwords or Draft2Digital. It’s specifically geared for Kindle format e-books to sell on Amazon KDP. Convertio converts both document files and existing e-book files into various e-book formats, including Kindle format. Convertio is a free online file conversion tool that converts various document and e-book files into Kindle format .mobi files, plus many others. It’s very easy to use and lightning fast. Once converted, you can download your Kindle book format files to your computer and upload to your website, share via marketing outlets or save to your Kindle via a USB connection or by emailing the file to your Kindle device. Calibre has been around forever and does a lot, but it has a steep learning curve. Calibre is free open source software used by e-book authors who need to convert manuscripts into Kindle book format and by readers looking to save e-book files to Kindle and other formats. Calibre is a very popular and free Kindle book format file converting tools, but it has quite a learning curve and an archaic interface compared to the modern e-book conversion options available. However, Calibre does have a large following among authors and voracious readers since it offers many specialized conversion features. There are numerous tools you can use to save an e-book in Kindle format. For simple file conversions for reading or distribution, Convertio is the easiest free option we’ve found. However, if you’re creating an e-book from scratch, you can spend days exploring, downloading and trying out different e-book writing and Kindle formatting tools. To save you the time and trouble of trial and error, we’ve uncovered the simplest and most economical way to create and save an e-book in Kindle format. Best of all, our solution uses free online tools that work on any computer or mobile device. Here are some foolproof — and completely free — ways that anyone can create and save e-books and documents in Kindle format. Whether you’re starting from scratch or have a finished manuscript, the solution outlined below will help you produce a finished e-book in Kindle format in no time. Did we mention every tool below is free? You certainly can write your e-book in whichever writing tool you’re most comfortable using. However, if you don’t have a preference, both Google Docs and Reedsy are free, cloud-based, mobile-friendly, and very simple to use. 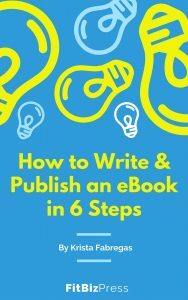 If you already have your manuscript completed, you can skip to the next section to see how to turn it into an e-book ready for publishing. However, if not, here’s why and when we recommend using Reedsy or Google Docs for the writing stage. If you’re writing a document specifically for e-book use, then you can write your work straight into Reedsy. Its interface is simple, clean and distraction-free, and it takes about five minutes to figure out. Reedsy even has a help sidebar if you run into questions, along with a chat feature. It also has both writing and editing modes, so you can protect your work if you use an editor to perfect your work, like the budget-friendly editing freelancers you can hire on Fiverr. Reedsy has a simple interface, intuitive screens and both writing and editing modes to track changes made by you or your editor. If you’ll be using your content for many purposes, such as an e-book, blog post and .pdf white paper, writing it in Google Docs gives you plenty of formatting, commenting and team collaboration options. Google Docs makes copy, header and image layout a snap, plus has a comment feature so you can make notes and reminders as you write. Google Docs is Google’s free cloud-based word processing software, and it’s a great content generation tool for both individual writers and content teams. Google Docs is simple to use, saves automatically, creates outlines, tracks versions and lets you share a document with editors or collaborators easily. 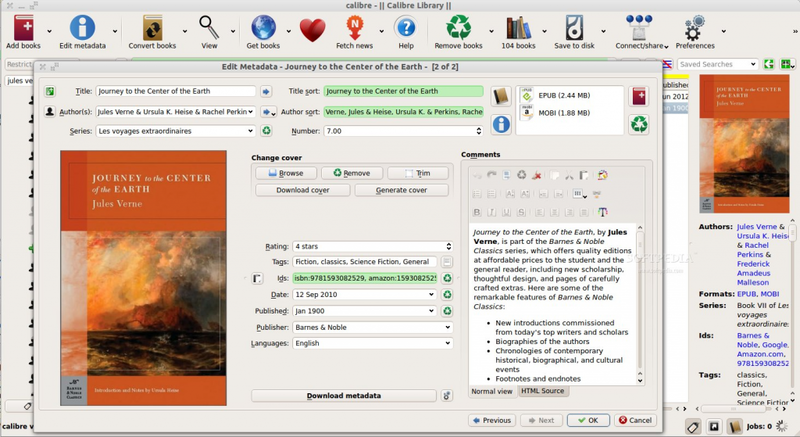 You can also use its built-in headers to organize your document and create a table of contents for your e-book quickly. Google Doc’s built-in header structure is perfect for creating headings and subheads that convert into a table of contents for your e-book. If you used Reedsy to write your e-book, this step is already complete since Reedsy formats your e-book as you write. However, if you wrote your manuscript in Google Docs or another word processing program like Microsoft Word, you can copy and paste it into Reedsy, chapter-by-chapter, to format your e-book. We copied and pasted a 7,000-word Google Doc manuscript into Reedsy in about five minutes and maintained every formatting element perfectly. As shown above, we copied and pasted a 7,000-word, eight-chapter document from Google Docs into Reedsy in less than five minutes and with perfect results. Our headers, images, bullets, links and line formatting all flowed in unchanged. If you’re a writer looking for a fast way to write, format and publish an e-book in Kindle format, Reedsy delivers an outstanding solution. Note: Reedsy doesn’t have an import tool, although they say that feature is coming. Right now, copy-and-paste is the only way to move an outside document into Reedsy. However, we found it to be quick, easy and completely accurate in formatting. After your e-book is complete, edited and the cover art is uploaded and entered your front and back matter, you’re ready for your last step, which is export your e-book file. In Reedsy, you select your file format and a few other options, and then hit Export and your e-book is saved and ready to distribute. KDP automatically converts various files to Kindle format, but an .ePub file created in a tool like Reedsy provides a consistent and seamless conversion. After uploading your .ePub file to Amazon KDP, the Kindle previewer shows you how your e-book will appear on various Kindle devices. 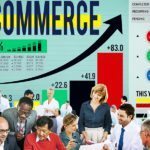 Not Planning to Sell Your e-Book on Amazon? Once your e-book is exported in Reedsy, you can download the file and share, sell, or distribute however you wish. Then, upload it to Convertio to save it as a Kindle format .mobi file. You can then upload your Kindle format e-book to your business or author website or share it in email and social media marketing for clients or readers to save and enjoy on their Kindle devices. Convertio turns your .ePub files into Kindle format files if you want to distribute them to Kindle users outside of Amazon. People use Kindle format e-book files for different reasons. Authors use it to sell e-books on Amazon KDP or to distribute Kindle-friendly e-books outside of Amazon’s Kindle sales system. Businesses can distribute e-books and presentations in Kindle format as marketing tools. Readers can convert nonAmazon e-book files and other documents into Kindle format to read them on their Kindle device. There are plenty of ways to save an e-book in Kindle format for all of these reasons, but some tools are more accessible and simpler to use than others. The easiest end-to-end tool for e-book authors is Reedsy — it’s a free, cloud-based, mobile-friendly interface delivers everything an e-book writer needs. However, Amazon KDP Kindle Creator helps authors convert most word processing documents with ease. For basic e-book file conversions, Convertio’s free Kindle file converter is hard to beat. However, if you’d rather hand your Kindle format e-book needs or file conversions off to the pros, the budget-friendly freelancers on Fiverr can get the job done fast. Fiverr’s Kindle format experts are ready to turn your documents into Kindle book format files to read on your device, distribute to customers or upload to sell on Amazon. What do you use Kindle format files for? Do sell e-books on Amazon KDP or need to distribute Kindle-friendly business documents outside of Amazon’s system? Are you converting e-book files to Kindle format to streamline your reading library? We’d love to hear what you use Kindle format e-books for and how you handle your conversions in the comments below.